This afternoon we were informed by Tarrant County Public Health (TCPH) there has been a confirmed West Nile Virus (WNV) positive mosquito sample collected from a testing site near you in the City of Fort Worth. A positive sample was collected in your area at Fire Station 19, 2613 Carnation. It’s extremely important that our community continue to work together to reduce the mosquito population by removing mosquito habitats from their property and remind their neighbors to do the same. Please remove all standing water in empty flower pots, pet bowls, outdoor toys, gutters, etc. When you’re outdoors, remember to wear repellent that contains DEET. Wear clothing with long sleeves and pants when applicable. Continued vigilance when it comes to preventing the spread of mosquito viruses in our community is essential. Since there have been West Nile Virus positive mosquitoes in your neighborhood, the city’s Code Compliance officers will be monitoring the area looking for litter and debris that could invite mosquitos to breed and nest. You can help by keeping your grass mowed and trees trimmed. Additionally, officers will check inspecting city property for standing water and addressing it. If there’s an issue with standing water at a location that is not city property, report it to the City’s Customer Care Center at 817.392.1234. Additional Questions? Contact the Tarrant County Public Health Zika Hotline at: 817.248.6299. Thank you so much for all your continued efforts. 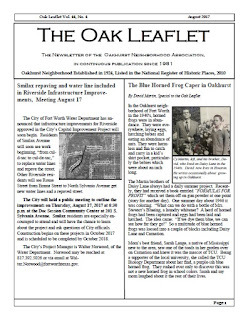 Read the August Oak Leaflet, Now Online!